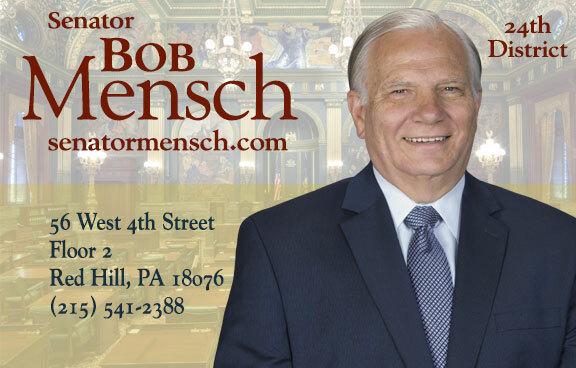 PA State Senator Bob Mensch represents the constituents of the 24th District (including parts of Berks, Bucks and Montgomery) bringing to the state Senate more than 35 years of business and management experience, coupled with political leadership and public service. He serves as Majority Caucus Chairman and is Vice Chairman of the Veterans Affairs & Emergency Preparedness Committee. He also sits on the Appropriations, Public Health and Welfare, Game and Fisheries, and Aging and Youth Committees. Please join me, Senator Bob Mensch, for a live telephone town hall to discuss important state-related issues impacting you and your neighbors in the 24th Senatorial District. This type of meeting allows you to listen in and ask me questions from the comfort of your own home via your telephone or live audio stream. Sign up here to register and receive a call for my next telephone town hall. I look forward to hearing from you.